Born in 1973, Visone studied screenplay writing at the Academy of Fine Arts, Brera. 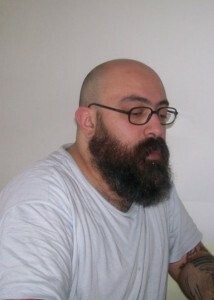 His interests include: industrial music (his soloist musical project is Mariae Nascenti), underground queer cinema (participation in video group shows and festivals, especially during his student years), design (his works have appeared in various fanzines and publications, including The Black Book. This Is the Salivation Army by Scott Treleaven). He is a queer activist and co-founded the Pornflakes Queer Crew in 1999.